Complete interactive APP, prepared by a dedicated team of exam experts, with everything you need to pass the Evolve Reach Admission Assessment Exam! Practice Tests, Self Assessments, Quizzes, Tutorials, and more! 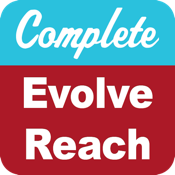 The Complete Evolve Reach app is a comprehensive tool for increasing your score! Covering the all Evolve Reach content areas, math, reading comprehension, anatomy and physiology, English grammar, biology and chemistry, this interactive APP is a unique study system designed to get you up to speed fast, and get the best possible score. This Evolve Reach app contains all the material in the paperback version, over 400 pages, plus free bonus extras! Review of all systems, including the circulatory, digestive, integumentary, immune, reproductive, respiratory, skeletal and urinary systems. Each in-depth tutorial includes, an overview of the system, functions, components (illustrated), common diseases and disorders as well as medical terminology. Please note that Evolve Reach is a registered trademark of the Health Education Systems Inc., which was not involved in the production of, and does not endorse, this product. How to Take a Test - The Complete Guide - Let’s face it: test-taking is really not easy! While some people seem to have the natural ability to know what to study, how to absorb and retain information, and how to stay calm enough while actually taking a test to earn a great score, most of us find taking tests to be sheer misery. This is one of the most important of the Complete Evolve Reach App. Before you are ready to take the all-important Evolve Reach Exam, you have got to know how to study for it. In spite of the fact that you have spent a good many years in school - first elementary, then middle and finally high school - the fact remains that while many teachers do a good job teaching content, few of them actually teach the fine art of studying! * How Long Should you Study? Maybe you have read this kind of thing before, and maybe feel you don't need it. Remember though, it only a few percentage points divide the PASS from the FAIL students. Even if our test tips increase your score by a few percentage points, isn't that worth it? Why not do everything you can to get the best score?